An EF-0 tornado touched down in Silver Spring, Maryland, Monday, leaving a trail of destruction in its path. The National Weather Service estimates the tornado was was 100 yards wide and was on the ground for two tenths of a mile along Dennis Avenue in the Northwood neighborhood. News4's Kristin Wright shows how far the cleanup has progressed, and Storm Team4 chief meteorologist Doug Kammerer explains how common tornadoes are in this area this time of year. 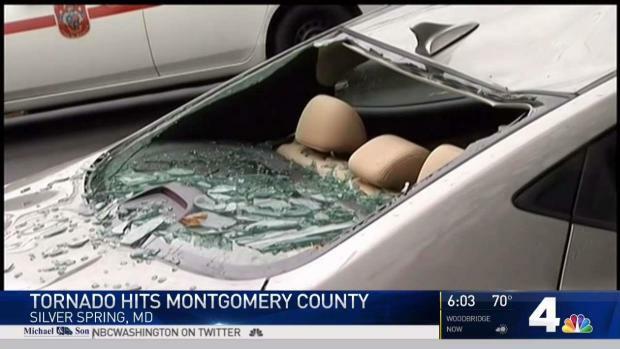 The National Weather Service confirmed a tornado hit Montgomery County, Maryland, Monday afternoon as severe thunderstorms barreled through the region. The NWS rated the storm at EF-0 on the Enhanced Fujita scale, typically characterized as superficial damage to structures and vegetation. They said peak winds reached 70 mph, and the tornado stretched along Dennis Avenue, from west of Edgewood Avenue to Eastwood Avenue in Silver Spring. The tornado only lasted about a minute, from 3:48 p.m. to 3:49 p.m., and was 100 yards wide. There were reports of non-life-threatening injuries, damaged homes, and trees and wires knocked down. The storms came over the mountains about noon and prompted watches and warnings throughout the area as they traveled northeast with heavy rain and 60 mph gusts of wind. They reached D.C. about 4 p.m. and were mostly gone by about 5 p.m. but left a path of damage and power outages. 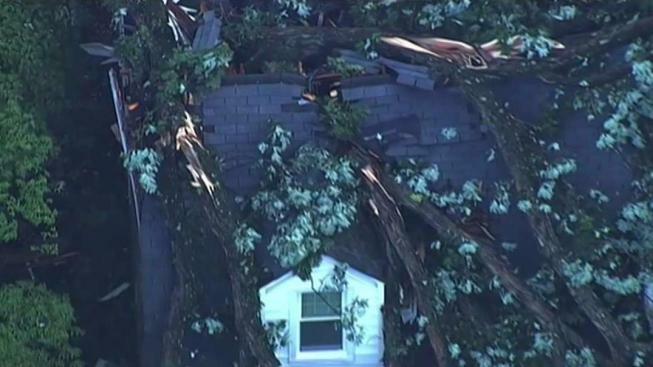 Several homes on Northwood, Dennis, Edgewood and Woodridge avenues in a three-block area of Silver Spring, Maryland, were damaged. One on Northwood sustained severe damage. Montgomery County Fire and Rescue is checking on restaurants. Washington Gas and Pepco are assisting with power outages and gas leaks. D.C. Fire and EMS responded to a tree down in the 5200 block of Nebraska Avenue. A flash flood watch went into effect for the region at 3 p.m.
Tens of thousands of power outages were reported across the D.C. area. At one point, more than 25,000 people in Northern Virginia were without power. Monday's warm, breezy morning helped push temperatures close to 90 degrees in advance of the storms. 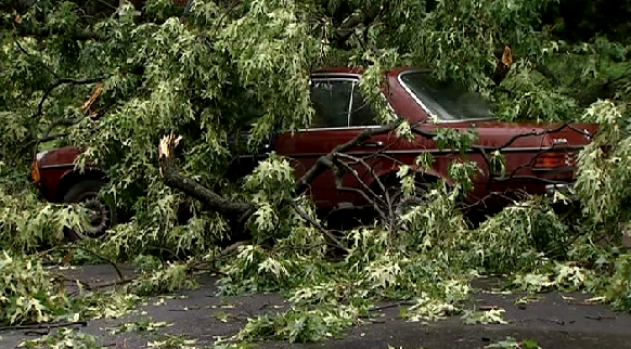 The National Weather Service confirmed it was a tornado that caused damage in Silver Spring. News4's Shomari Stone reports. Tuesday will transition back to sunshine. Highs will be in the mid 80s Tuesday and Wednesday, with sunny skies and low humidity.